Another finalist in Designboom’s Green Life contest, this noggin- and hand-warming duo by Germany’s Yiran Qian is one solar-power concept we could see ourselves wearing. (The talents of most engineering geeks don’t always extend to aesthetics…which poses a problem.) Artfully arranged into snowflakes, Endless Warm’s ultrathin solar panels harness the power of the sun and convert into life-giving heat. The designer waxes poetic: “The endless warm come from so far away but it can reach every fingertip of you. The sun is so far, the sun is so close.” Deep. 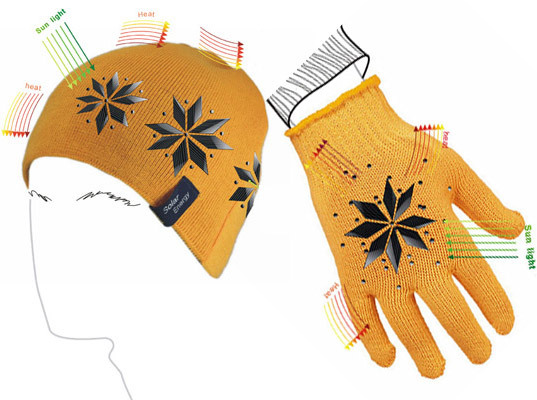 Solar-Powered Hat and Gloves Offer Promise of "Endless Warm"
Another finalist in Designboom's Green Life contest, this noggin- and hand-warming duo by Germany's Yiran Qian is one solar-power concept we could see ourselves wearing. (The talents of most engineering geeks don't always extend to aesthetics...which poses a problem.) Artfully arranged into snowflakes, Endless Warm's ultrathin solar panels harness the power of the sun and convert into life-giving heat. The designer waxes poetic: "The endless warm come from so far away but it can reach every fingertip of you. The sun is so far, the sun is so close." Deep.